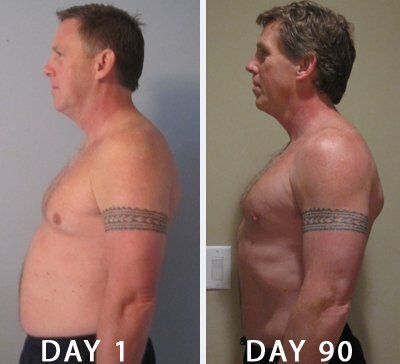 I was following up with some customers, and was especially curious about Terry as I knew from previous correspondence that he was getting closer and closer to completing the P90X workout. I was completely surprised when he emailed me back with some before and after pictures, and I could be crazy, but I thought he looked YOUNGER. Read his testimonial, and tell me if you don’t agree. Great job Terry!! From Terry: I had just turned 51 and I had stopped recognizing myself in pictures. I was active, playing tennis twice a week and working out at the gym twice a week but my body was in a rut. I did the same work out every time I went to the gym but I couldn’t understand why I wasn’t losing any weight. When I noticed my chiropractor had lost a significant amount of weight I asked him how he did it. P90X was his answer. I had never heard of P90X or seen any of the infomercials but I googled it and read about muscle confusion, it made sense as to why I wasn’t seeing any improvement. So I made the leap and sent away for the program, bought a pull-up bar, adjustable dumbbells, yoga mat & block and bands. The first few weeks were tough. It took me at least an hour and a half to finish the 54 minute work outs because I had to hit the pause button after almost every exercise. I had bought into the concept of “bringing it” but found myself bringing it to the porcelain deity more often than not. But each week I got stronger and after taking my 30 day pictures and seeing the tremendous improvement I was hooked. I feel like P90X has brought me back to looking like the person I remember. I’ve been told I look years younger and I feel years younger. We now have a saying in our house that we use whenever someone is not putting their all into something…. “Get down there Mr. Haus, this is P90X my brother”.